On 8th.July 2018, No.20 spent its last day in traffic before a well-earned overhaul by the Ribble Steam Railway. Then 90 years industrial use! I enjoy travelling on our rail system whenever I can and in August every year there are two important dates on my calendar that allow me to take the train. The first is a regular trip to Wells in Somerset, where I spend a ‘Boy’s Weekend’ away with a group of railway modellers who enjoy each other’s company and the show put on in the city by the Wells Railway Fraternity. It is always a great show and it gives me a chance to meet up with people I don’t see regularly. To get there involves a train trip to Bristol and then a bus ride to Wells. This bus journey is a much better arrangement than using the car, which I did up to a couple of years ago and it allows me to be able to enjoy the beautiful countryside we pass through. The increasingly heavy traffic, particularly on Sunday evening, made driving more and more difficult. My second special date is to attend the CRA Summer committee meeting on another Saturday in August. At this meeting we are able to take more time than is usually available, and apart from working through the important business of the Association, it gives us the chance to do a bit of broad thinking about the future and to try and work out what we need to do to make the organisation better. This year, however, I was not able to attend due to a massive holiday-time blockade on the West Coast Main Line between Euston and Milton Keynes. There were alternatives, but none seemed to come in at less that four hours each way, twice the usual Journey time. Some of these alternatives involved a bus ride and it is surprising to me that whilst I am prepared to take a bus between Bristol and Wells and enjoy it, the thought of using the same means of transport between two railheads fills me with dread. It’s funny that two very similar journeys should have such a different impact. Normally there is quite a bit of work to do in preparing for our meeting, though this time it was a bit more than usual as I was going to miss it. 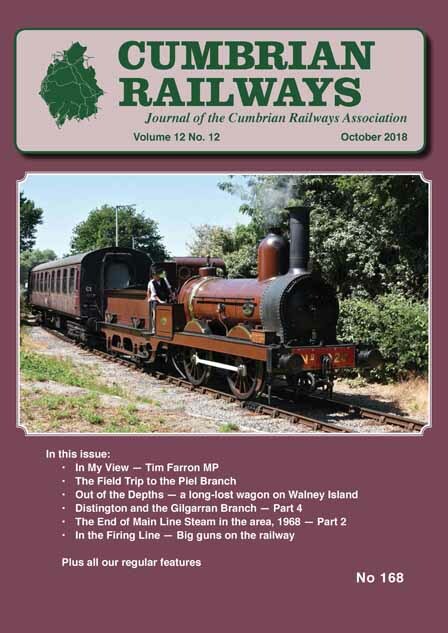 One proposal I put forward was to be able to produce a special issue of Cumbrian Railways to enable me to publish two very important articles that are waiting to go into the regular Journal. These two pieces are both relevant to the Great War, so it is imperative that they should appear within the centenary commemorations. Putting them between one set of covers not only makes sure you are able to read them as soon as possible, it also means that space is freed up in Cumbrian Railways to be able to publish more of the wondrous contributions I have from members who have been waiting patiently to see them in print. This special issue was agreed and it will be produced as a stand-alone book, and will be an addition to the normal run of the Journals. Hopefully it will be out very soon. In this issue we have a number of anniversaries to celebrate. This year is the seventieth anniversary of the forming of British Railways and to record this I have selected a few contemporary photographs from our collection. These images illustrate the tentative attempts to produce a new locomotive livery scheme in the months following Nationalisation. The story of the fiftieth year since the last days of steam on British Railways continues with some observations and research conducted by Tony Jenkinson. Tony continues on from Ron Herbert’s epic record of every train operated in our area in the period running up to the final services. It is worth noting that an extended version of Ron’s article has appeared in the magazine, Steam World, and covers a wider area of the operation of these trains in the north west of England. It is interesting to note that the two events were only separated by twenty years. Bringing things up to date, the operation of our local railways has recently been both depressing and dismal. The problems following the introduction of the new timetable in May had a great impact on all of the services operated in the county. We have been able to look at one aspect of this chaos. The rail services on the Lakes Line to Windermere were temporarily withdrawn and were initially replaced by a bus shuttle. This imposed hardship on an important tourist area, at just the time the season was getting underway. We are able to record the work done by the West Coast Railway Company in stepping in to help solve the immediate problem. Tim Farron, Member of Parliament for Westmorland and Lonsdale, has written about his view of the way Northern have operated and his hopes for a long-term solution to the problem. History started yesterday and it is proper that we record these momentous events for the future.